According to the Centers for Medicare and Medicaid Services (CMS), in 2018 the electronic health record (EHR) adoption rate by office-based physicians has steadied at 87%. But there are still a handful of physicians who are not using an EHR. With quality reporting regulations from CMS tightening, many holdouts are reexamining whether or not it’s finally time to invest. Reduce paperwork. 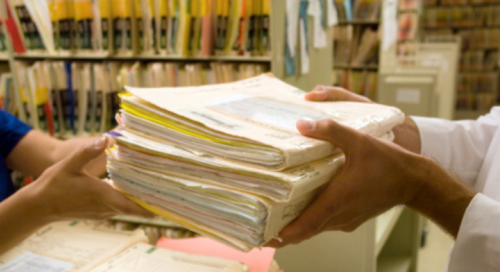 This is obvious, but EHRs are intended to reduce the amount of time providers spend doing paperwork. An EHR can increase your practice’s efficiency by streamlining tasks. Full encounter documentation is improved, and an EHR’s automated coding capabilities also provide ease of use. Automate tasks. EHRs can be programmed for easy or automatic delivery of information that needs to be shared…whether it’s with public health agencies or with CMS for the purpose of quality measurement. Reduce administrative costs. EHRs can reduce the need for transcription costs, and can help reduce chart pull, storage, and re-filing costs. Reduce errors. With better access to patient data and error prevention alerts built into the EHR, the incidence of patient error can be reduced. Improve patient health. Improve quality of care through better disease management and patient education. Many EHRs have a patient portal to securely send messages, such as lab results, treatment plans, follow-up testing, medications, and more. These help patients take control of their health. Enable e-prescribing. Electronic prescribing, or e-prescribing, allows doctors to communicate directly with the pharmacy. This feature helps reduce medication errors, checks for drug interactions, and is generally more convenient for patient, doctor, and pharmacy. In fact, many states are required by law to use e-prescribing as a means to prescribe controlled substances. Communicate with other healthcare practitioners. An EHR can help enhance communications with other clinicians, labs, and health plans because of its easy access to patient information from anywhere, anytime. Those with an EHR have the ability to track electronic messages, automate formulary checks by health plans, order and receive lab tests and diagnostic images, and link to public health systems, such as registries and communicable disease databases. Enhance revenue. An EHR gives practices the ability to meet important regulation requirements through alerts that notify physicians to complete key regulatory data elements that can help your practice avoid penalties. It can also help reduce time and resources needed for manual charge entry, resulting in more accurate billing and a reduction in lost charges. Reduce duplication of testing. Because all of the patient’s health information is in one place, it’s less likely that providers will have to spend time ordering and reviewing the results of unnecessary or duplicate tests and medical procedures. Improve quality. Use the EHR to proactively track and benchmark clinical quality measures and access real-time scorecards that help identify improvement opportunities. Quest Diagnostics offers certified electronic health record technology (CEHRT) to help you not only improve practice workflow, but also meet any Quality Payment Program (otherwise known as MACRA) mandates for 2018 and beyond. To learn more about the Quanum™ EHR, contact us at 1.888.491.7900.